Getting a psychic reading, using tarot cards and oracle cards, Tasseography (tea leaf reading) and Aeromancy (cloud reading divination) are all ways that we can predict our future. But you may not have tried using dominoes. Now, you might be used to playing a friendly game of dominoes with your family, but you might be unaware that you can actually use them to help predict what lies ahead. Using dominoes for a psychic reading is really very simple. Take your pack of dominoes and place them all face down on a table or the floor. Ensure every domino is face down and then mix them up so you are completely unaware of which domino is which. If you want to do a general reading then pick up to three dominoes at random and use the list below to interpret the meaning. 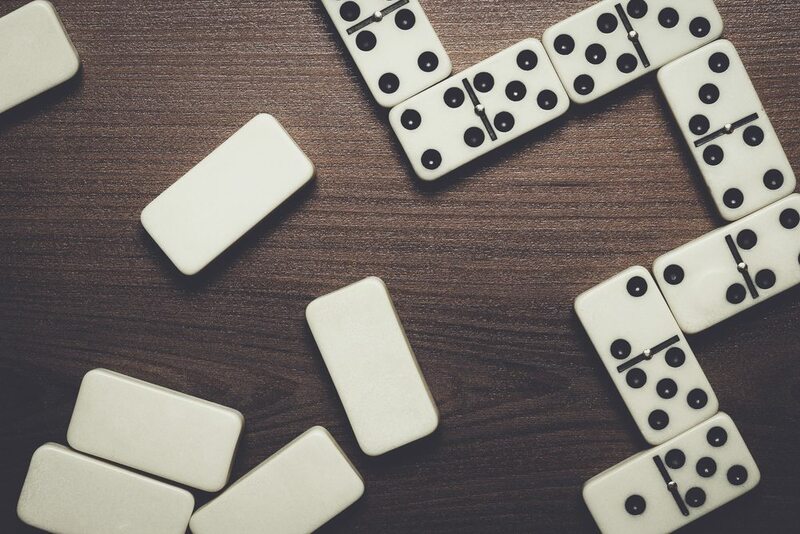 It’s worth noting that if you’re choosing more than one domino, after you’ve picked your first domino, make a note of it and return it to the group and mix them up again so that it is eligible for selection again. Do this after every domino you choose. If you get the same domino more than once then the universe is really trying to tell you something! However, you can also use dominoes to get the answer to a specific question you have in mind. In this instance, when you’re mixing up the dominoes face down, have your specific question prominent in your mind. Spend a few minutes thinking about your question before you choose your domino. It’s best to only choose one domino if you’re looking to get the answer to a specific question. Of course you can ask more than one question and choose another domino! What does each domino mean? 6:6 – Considered the best draw, this domino foretells luck and fortune in every aspect of your life. This is a really positive draw. 6:5 – An important event is in the offing so prepare as best you can. 6:4 – Conflict may be on the horizon – possibly to do with money or legality? 6:3 – A trip or some travel is in your future. You just need to get away. 6:2 – Material possessions may come into your hands which you might not know what to do with at first. 6:1 – A close friend or family member will need you for help or advice in the near future. Do your best to help them. 6:0 – You may find you don’t know someone as well as you thought. They will wrong you. It’s a shame but you could be better off without them. 5:5 – A change of scenery with regards to your home may be beneficial to you. 5:4 – Invest now and your rewards will be plentiful! Now is the time to take that risk. 5:3 – Someone from your past may visit you with some important news. It isn’t clear if it is good or bad. 5:2 – An unexpected invitation is on the cards. 5:1 – A new spark is lit! Either a new romantic partner will soon enter your life or you will reignite the spark in your existing relationship. 5:0 – Someone close you is about to receive bad news. Make sure you are there for them. 4:4 – Now is the time to let loose. If you’re debating playing it safe or letting your hair down, choose the latter. You won’t regret it. 4:3 – You may have lost your way a little bit amidst some chaos at home. It will soon pass. 4:2 – Be careful not to lose something important to you. It could be that you’ve misplaced it or it has been taken from you. 4:1 – A few money woes may be on the horizon so start planning ahead. 4:0 – A message of some sorts might get your back up. Try not to let it consume you. 3:3 – A union lies ahead. It may be a wedding, a shared home or even a new pet! 3:2 – Careful with your money around this time. Don’t start splurging on unnecessary things. 3:1 – A shock comes to you and those close to you. It’s hard to tell if it’s good or bad. 3:0 – Children seem to consume you. Whether they’re your own, family members or in your place of work. 2:2 – Jealousy rears its ugly head. Letting it consume you can only lead to more heartache. 2:1 – Scatterbrain? You may find the essentials escaping you around this time; wallet, keys, phone etc. 2:0 – A break is in order. You definitely need some time out from everything. 1:1 – Something you thought long lost returns to you in a surprising way. 1:0 – Meeting a stranger could change your life – although whether it’s for the better still remains to be seen. 0:0 – You might feel like the world is on top of you at the minute. Everything is going wrong. But remember, the sun always reappears after the clouds. We hope you enjoy using dominoes to give you some insight into your future. And remember to keep up to date with all of our psychic guides here at Wishing Moon.